Diabetes - Sichuan PriMed Shines Bio-tech Co., Ltd.
PriMed Shines provides the world’s largest collection of well-characterized spontaneous diabetic rhesus monkeys. 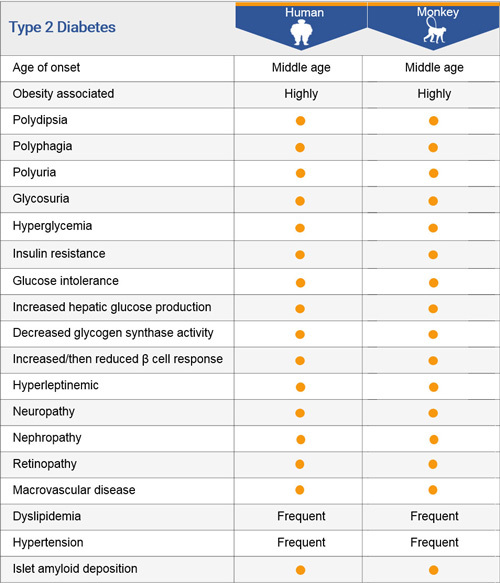 NHP models of Type 2 diabetes (T2DM) display all of the characteristics of diabetic patients at different stages of the progressive disease, including obesity, and complications such as nephropathy and retinopathy. Our well-characterized models have been validated for metabolic defects including glucose intolerance, impaired insulin response, insulin resistance, impaired pancreatic insulin secretion function, reduced glucose disposition, etc. Breeding center: n=~3000 rhesus macaques. Colony of n=~300 well-characterized spontaneously diabetic rhesus monkeys. Historical clinical /metabolic data (8yrs.) by semiannual metabolic screenings. Plasma and tissue sets cover normal to prediabetic, diabetic, and insulin dependent diabetic NHPs.